Hello and happy Friday! 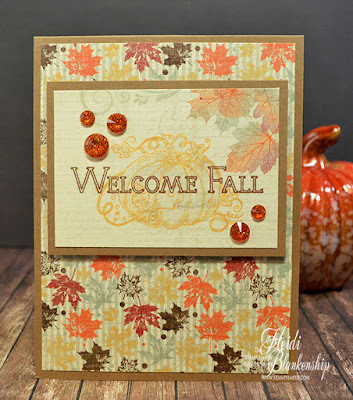 Today, I have another CAS (Clean And Simple) Fall card to share with you using one of the new Stamp Simply Clear Stamps - Welcome Home SS-020. Here is the card I designed. Check out these beautiful papers from Bo Bunny - Dreams of Autumn! All of the papers in this collection are so pretty and I love the little touches of turquoise and purple in the papers too. The little foxes are so adorable! I used a white A2 card base and added a piece of the pattern paper to the front of the card. Then I used a couple more patterns of paper and layered them together. 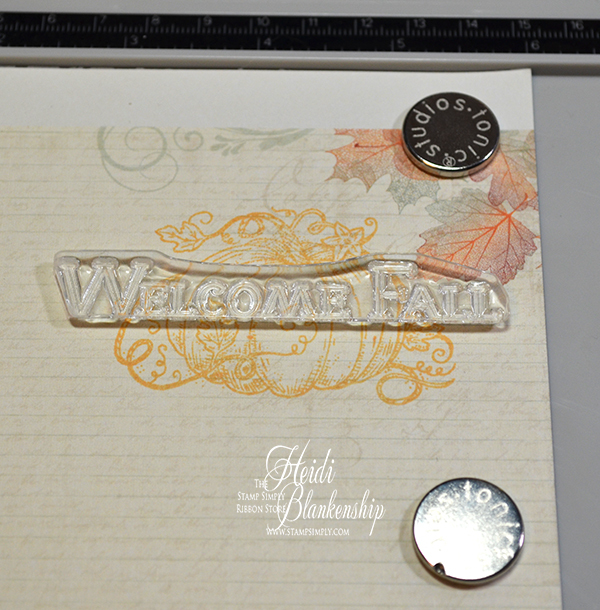 I used the Tim Holtz Stamp Platform to stamp the sentiments from the Welcome Home stamp set. I stamped the word Thankful three times going across the front to create a word border. Then I added three colors of the May Arts Burlap String - Brown, Purple, Yellow and wrapped the center of the card. I looped the ends of the burlap string and then added a Petaloo Botanical Collection Purple Baby Blooms flower to the center. Here is a close up of the card. I added a few Simple Stories Enchanted Enamel Dots for embellishments. To finish off the card I added some Foam Tape in between the paper layers. Hello everyone and happy Friday! 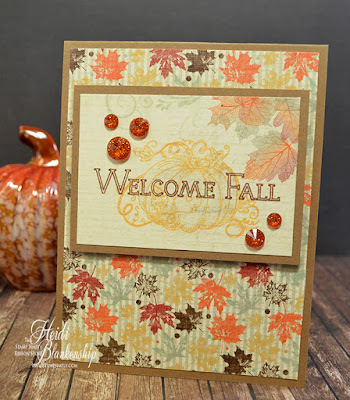 Today, I have a CAS (Clean And Simple) Fall card to share with you using the New Welcome Fall SS-020 stamp set from Stamp Simply Clear Stamps. 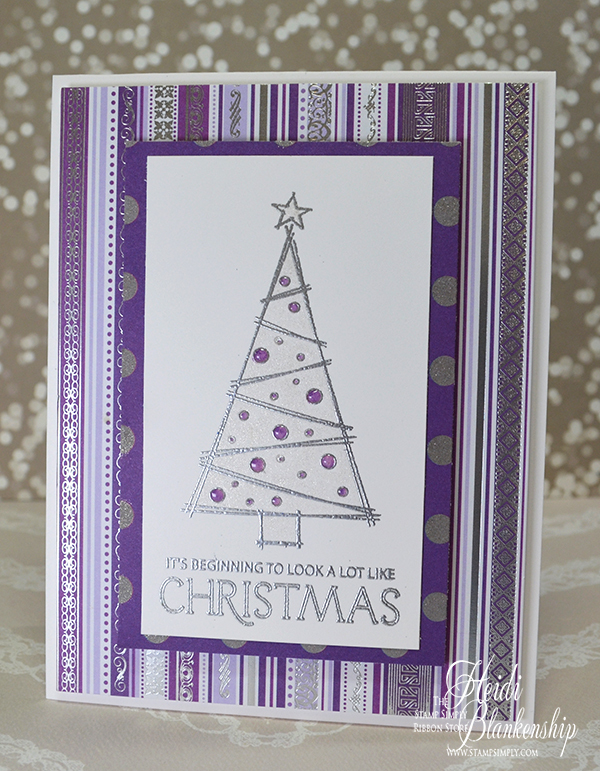 For my card I used some of the beautiful papers from the Authentique Bountiful collection. 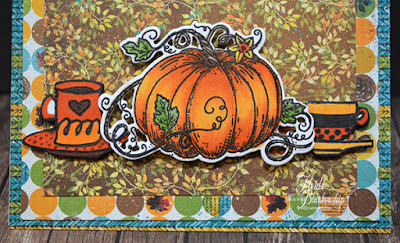 I used the Tim Holtz Stamp Platform to stamp the image of the pumpkin from the Welcome Fall SS-020 stamp set using Altenew - Warm and Cozy (Sunkissed) ink. I used a piece of the pattern paper to stamp on. Here you can see a better image of the pattern paper I used. 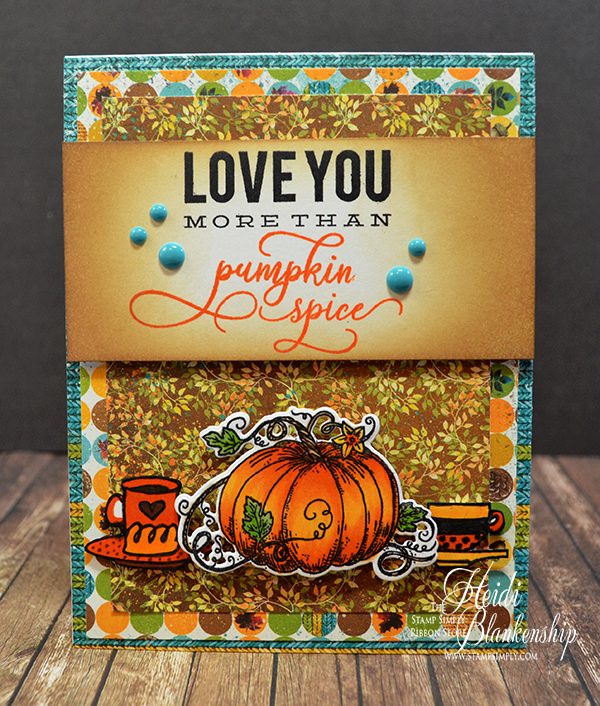 I lined up the sentiment across the image of the pumpkin and then I used Altenew Coffee Break (Espresso) ink to stamp it. I added a lot of shimmer to the leaves on the pattern paper and the sentiment using the Zig Wink of Stella Clear Glitter Brush Pen. The nice thing about this pen is that it doesn't leave harsh line so you can quickly go over images and don't have to worry about every little detail. I used kraft paper to layer behind the sentiment. I used Foam Tape in between a couple of the layers and then I added some really pretty Prima Crystals for embellishments. I adhered the card front to the base of an A2 kraft top folding card. Hello everyone! Last week I shared a New Fall stamp set from The Stamp Simply Ribbon Store and today I am sharing two New Christmas stamp sets. It's never too early to start creating Christmas cards. I know for myself it seems like after Halloween the time just goes by so fast and before you know it Christmas is here lol. For today's card I went with non-traditional Christmas colors. I used some of the beautiful papers from the KaiserCraft - Christmas Jewel collection to create a CAS (Clean And Simple) card. 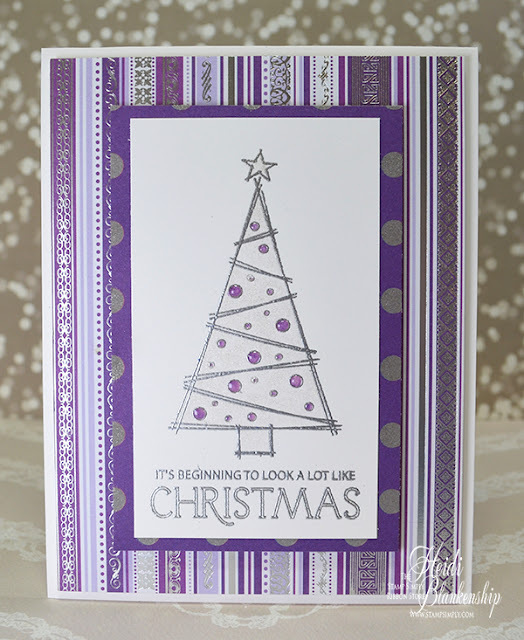 The fun image of the Christmas tree is from the Stamp Simply Clear Stamps - O Christmas Tree SS-021 and the sentiment is from the Wonder of Christmas Sentiments SS-022. 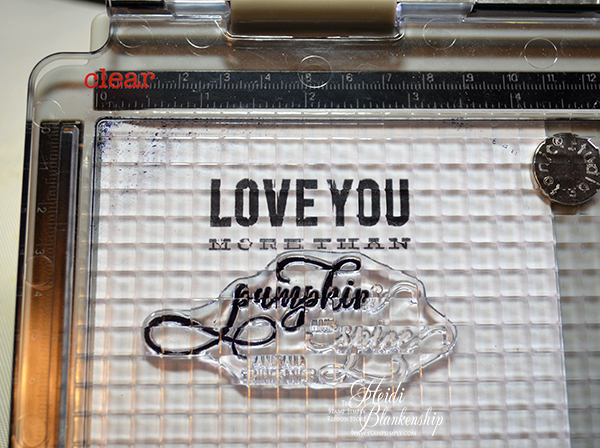 I used the Tim Holtz Stamp Platform to stamp the image and sentiment at the same time using VersaMark Ink. 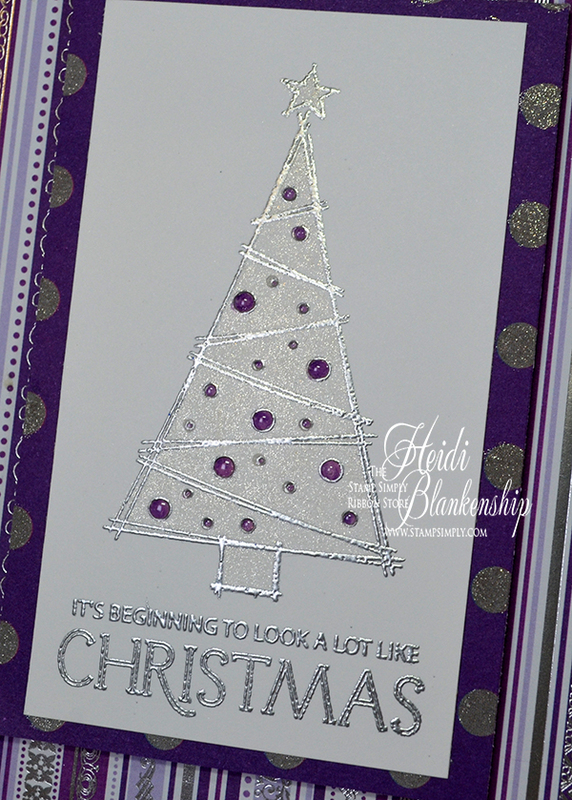 Then I heat embossed using Ranger Super Fine Silver Embossing Powder and a heat tool. 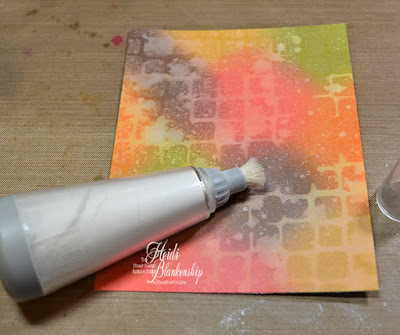 Before I did the stamping I also prepped the paper using the EK Success Powder Tool. This is such a great little tool to have in your stash! To color the little circles I didn't have the exact same color of purple so I used two Copic markers and touched them tip to tip to create the color I needed. Then I colored in the rest of the tree with the Zig Wink of Stella Clear Glitter Brush Pen. Here is a close up to see all of the shimmer on the Christmas tree. I also added some Ranger - Glossy Accents to the little circles. On the polk-a-dot paper I colored the dots around the outer edge with the Wink of Stella to add even more shimmer. I layered a couple different pieces of the pattern paper and used some Foam Tape in between to the layers for some added dimension. If you wanted to make the card even more CAS you could skip the foam tape in between the layers and the glossy accents. This would be a quick and easy card to make multiples of for Christmas. The card base is a white A2 top folding card. Thanks so much for joining me today! 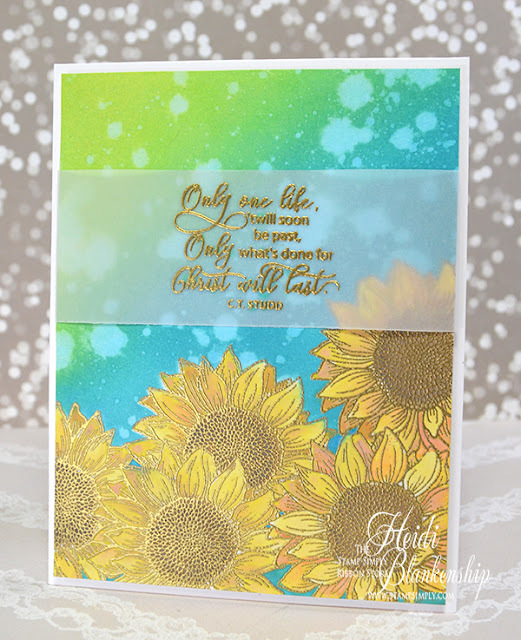 If you would like to see more card inspiration using the New Stamp Simply Clear Stamps I encourage you to check out the Stamp Simply Blog. 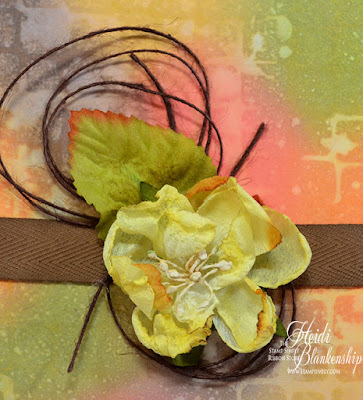 All of the supplies used to create my card can be found at The Stamp Simply Ribbon Store. 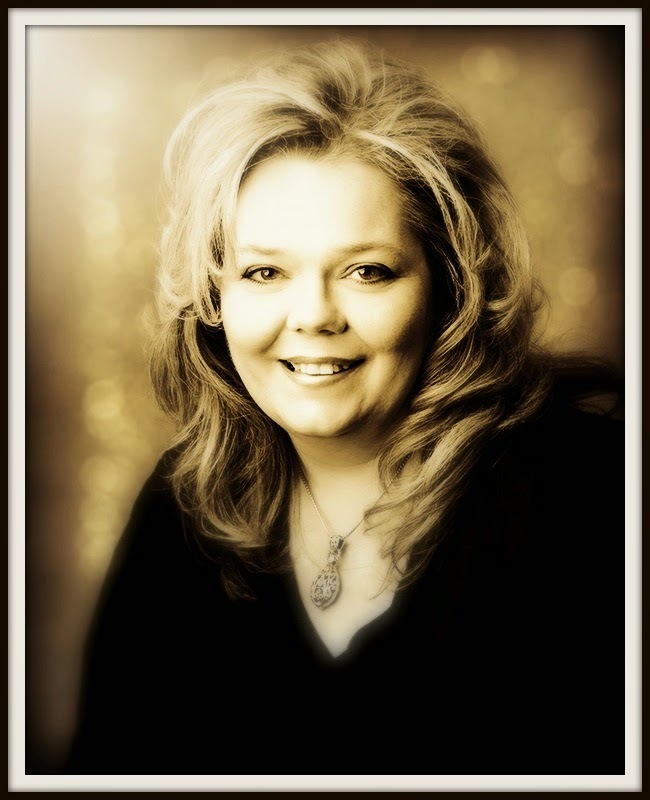 I hope you are having a wonderful and creative week! Hello everyone and happy Friday! Today, is my day to post for The Stamp Simply Ribbon Store and I am also participating in the 2017 FALL Coffee Lovers Blog Hop. 2017 FALL Coffee Lovers Blog Hop. 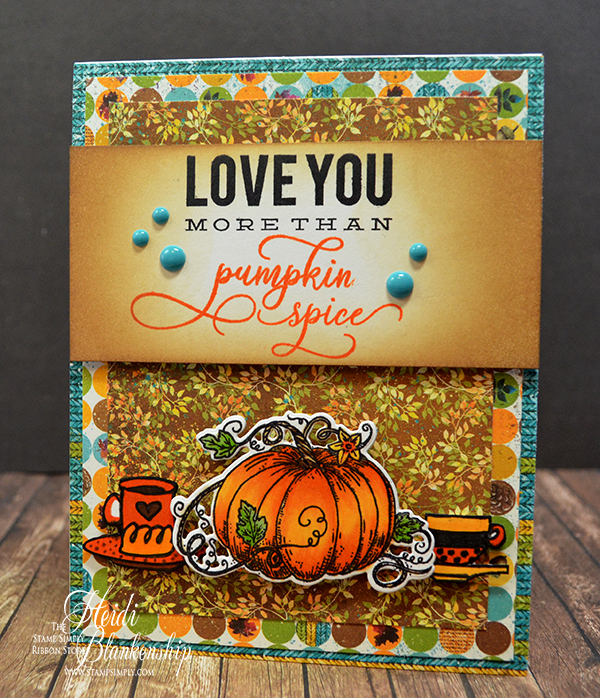 Here is a look at the card I designed for the 2017 FALL Coffee Lovers Blog Hop. You are also getting a sneak peek of the NEW Stamp Simply Clear Stamps - Welcome Fall SS-020 and Stamp Simply Steel Dies - Welcome Fall Pumpkin SS-DIE009. I also used a couple of the coffee cup images and part of a sentiment from the Altenew - Coffee Love stamp set. I love being able to stretch my stamps or use multiple stamps to create something new and that is what I did for the sentiment on this card. Using the Tim Holtz Stamp Platform makes it so easy to use multiple stamps and create your own unique images or sentiments. To do this you can use a post-it note or even just a piece of paper. Cover up the part of the stamp that you don't want to ink. Then, ink up the other part of the stamp, remove the inky paper piece and stamp as usual. 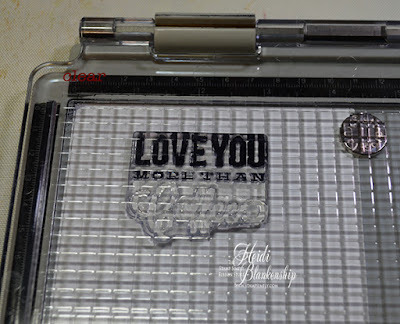 You can see here I only inked up the part of the sentiment that says I love you more than with Memento Tuxedo Black. 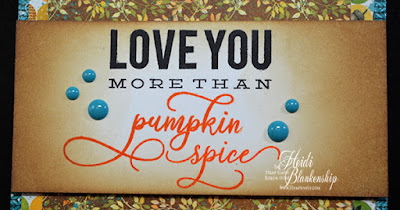 This is a great sentiment because you can add so many different this after the word than to create unique and personalized sentiments. 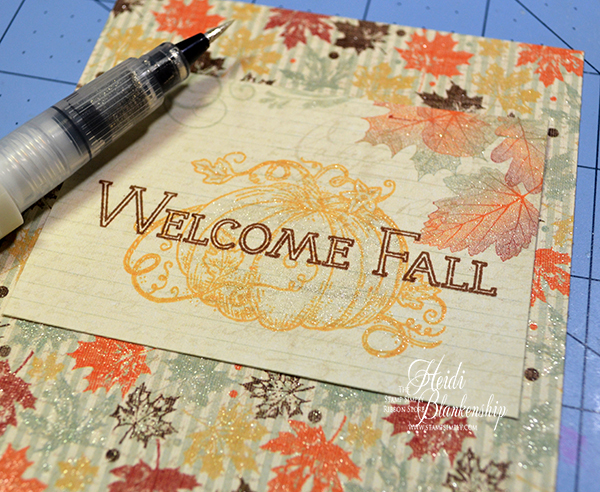 Next I lined up the stamp from Welcome Fall SS-020. 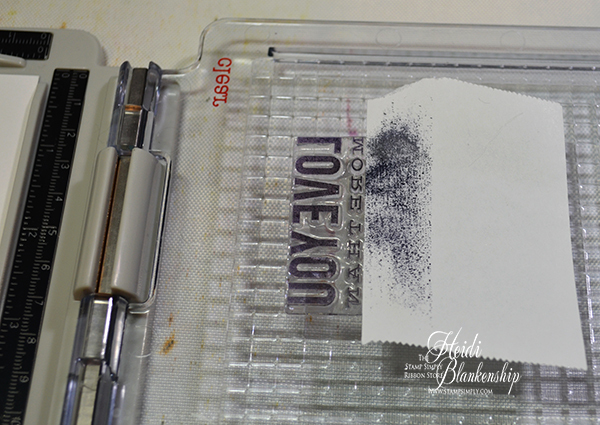 I repeated the same process by covering part of the stamp, adding the ink, remove the paper and stamp. 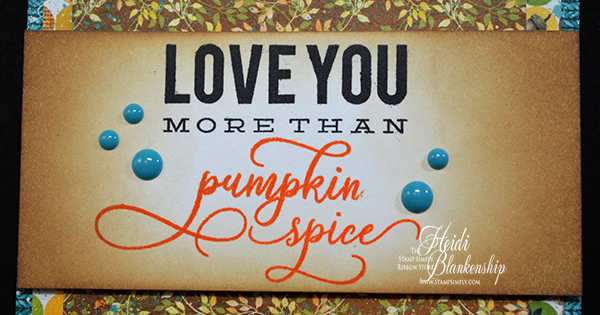 On my card I used Altenew Warm and Cozy (Orange Cream) for the pumpkin spice part of the sentiment but in the photo I used black ink so it would show up better. I repeated the same process for the word spice. Here you can see a close up of the finished sentiment. 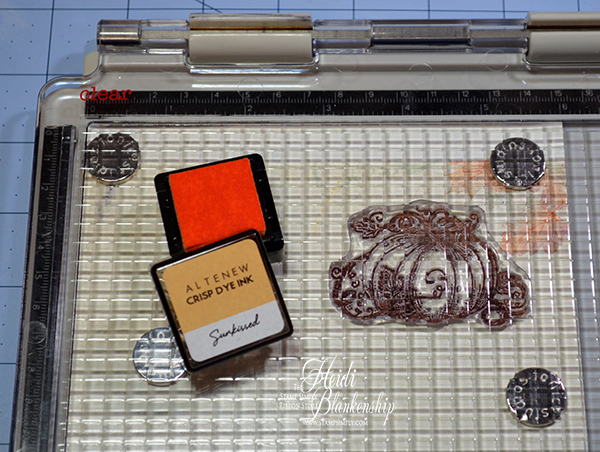 I inked the edges of the paper using a Ranger Mini Ink Blending Tool and Tim Holtz Distress Oxide Ink Vintage Photo. I added My Mind's Eye Follow Your Heart Enamel Dots for embellishments and to pull in some of the aqua blue color from the pattern papers. Here is a close up of the images. I used Copic markers for all of the coloring. I fussy cut the coffee cups and added some Foam Tape to the back. I used the coordinating die for the pumpkin and I added two layers of foam tape to the pumpkin. All of the pattern paper is from the Bo Bunny Dreams of Autumn collection. 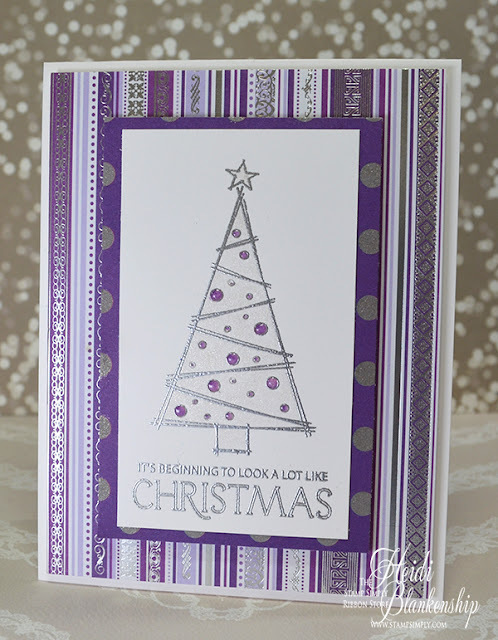 I used a white A2 top folding card base. I hope you enjoyed today's card share! Don't forget to check out The Stamp Simply Blog and 2017 FALL Coffee Lovers Blog Hop. 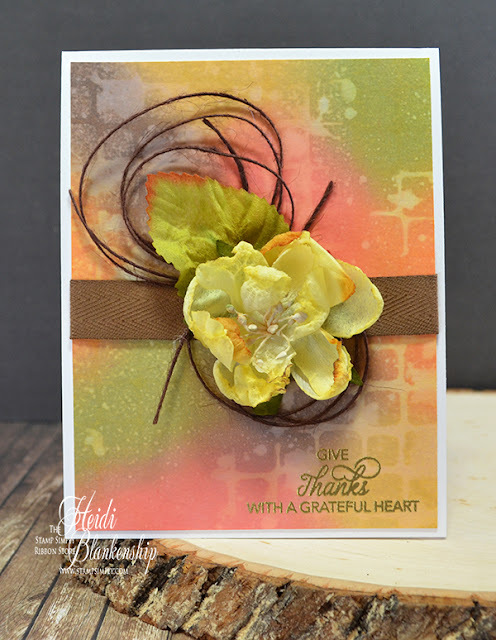 All of the supplies used to create my card can be found at The Stamp Simply Ribbon Store. Thanks so much for joining me today and I hope you have a wonderful weekend! Hello everyone and happy Friday! I don't know about you but for me it seems like this week just flew by. School is back in full swing and Fall is in the air here in Minnesota. The temps are getting down into the 50s and 40s at night. It's perfect sweatshirt weather. 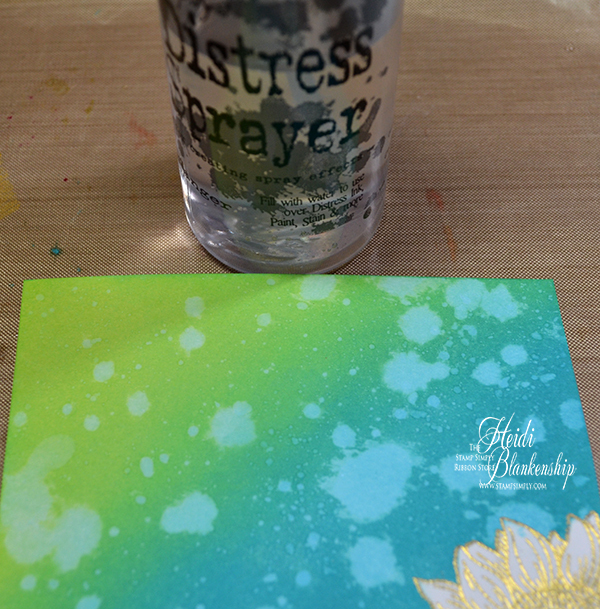 Today, I have a technique to share with you using Tim Holtz Distress Oxide Inks, a stencil, and some water. It's a fun, quick, and easy technique for creating a beautiful background with color and depth. Here is the card I designed. I love the beautiful mix of colors and it reminds me of Fall leaves. 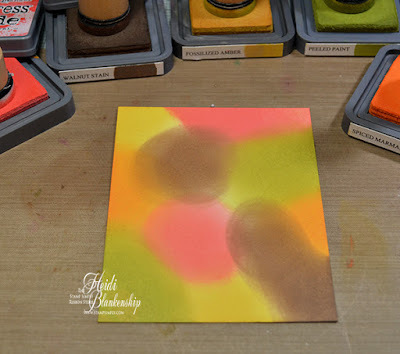 I started by applying the Tim Holtz Distress Oxide Inks - Fossilized Amber, Spiced Marmalade, Abandoned Coral, Peeled Paint, and Walnut Stain to a piece of Ranger Watercolor paper. 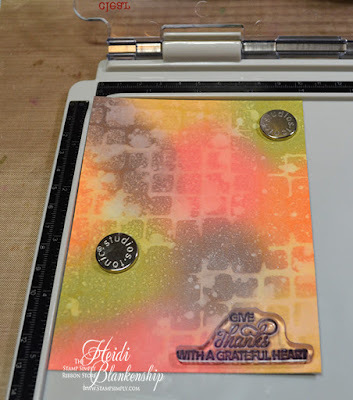 I used Ranger Mini Ink Blending Tools to apply the ink and I did all of the ink blending on the Craft Mat. I wanted to share this first picture with you so you could see how the paper looks after applying the first layer of color. Right now it looks like a hot mess and has sharp edges of color--but that's ok. I know when it comes to ink blending a lot of people put one layer of ink down and then they get discouraged because it doesn't look good. 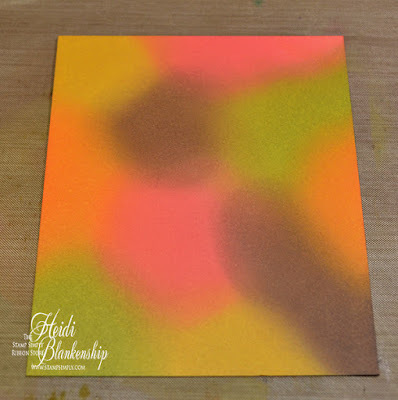 To achieve a nice soft blend that looks like the colors just melt into each other the ink blending has to be done in layers. Here is the ink blending once I was done. There is a big difference between the two pictures. I repeated the ink blending three times and each time I used a lighter touch. Hopefully seeing these two pictures is helpful to achieving a nice soft ink blended background. 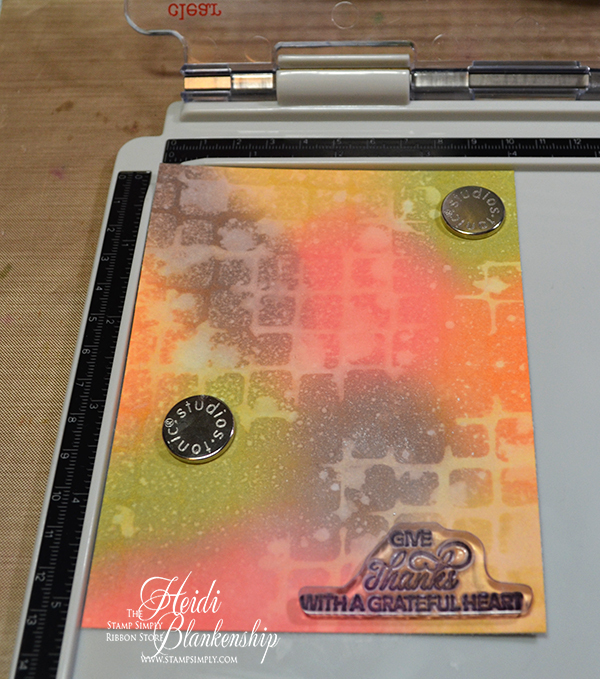 Next, I taped down the Tim Holtz Tiles Layering Stencil to hold it in place. Then I used the Distress Sprayer to apply water to the top left corner. 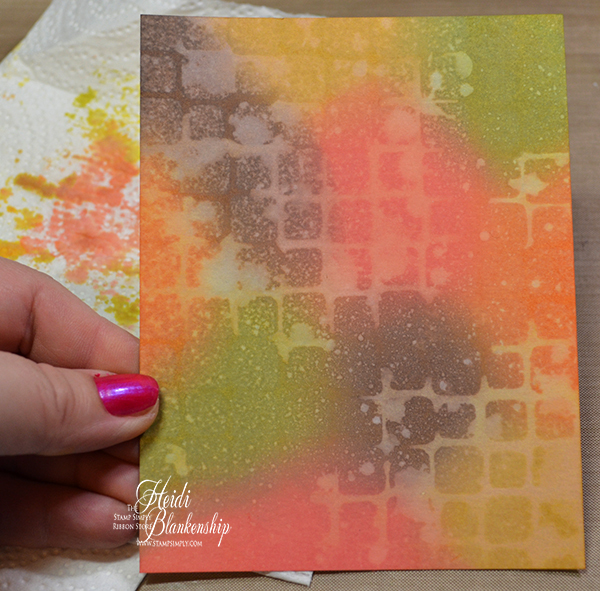 I carefully lifted up the stencil and used a paper towel to blot up the excess water. The Distress Oxide Inks react with the water so you will get a really nice background with the stencil design. I used a heat tool to speed up the drying time and then I repeated the process in the lower right corner. Here is the end result. I love how you can see the pattern from the stencil but the pattern and lines aren't perfect and it gives the paper depth. 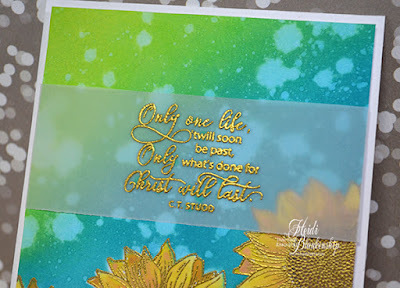 I wanted to do some heat embossing in the lower corner so I used the EK Success Powder Tool to make sure the embossing powder would only stick where I wanted it too. To stamp the sentiment I used the Tim Holtz Stamp Platform from Tonic. I made sure that I had the cover of the platform on the Clear side which allows me to easily use clear stamps. I used the two magnets to hold the paper in place and lined up my stamp, closed the lid to pick up the clear stamp, applied ink and closed the lid to stamp. The sentiment is from the Stamp Simply Clear Stamps - Harvest SS-010 set and I used VersaMark Ink. Here is a close up of the corner to see the sentiment. For the heat embossing is used Ranger Super Fine Detail Gold Embossing Powder. I applied a piece of May Arts Brown 5/8" Twill ribbon across the front of the watercolor panel. Then I added some May Arts Brown Burlap String, a leaf, and flower from Petaloo Botanica Yellow Blooms collection. I used hot glue to quickly apply everything in a nice little cluster on the background paper. 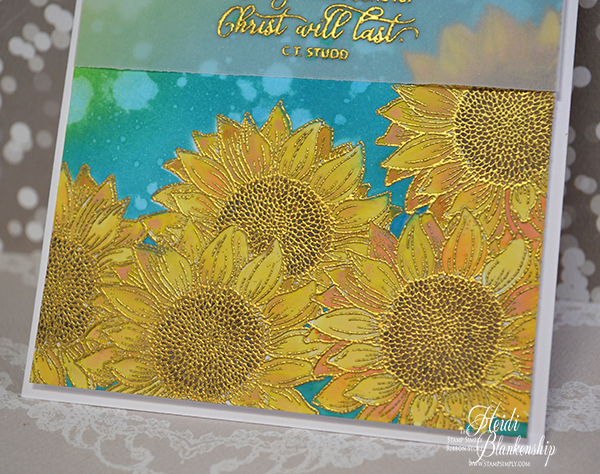 To finish off the card I applied the watercolor background to a white A2 top folding card base. Using the Distress Oxide Inks, water, and a stencil you can create some really fun backgrounds. I hope you enjoyed today's tutorial and that you'll give it a try. Thanks so much for stopping by today! If you believe in the power of prayer please keep all of the people in Texas, Florida, and the Southern East Coast in your thoughts and prayers. We have family and friends in all those areas. I pray that everyone will be safe. Hello everyone and happy Friday! As I mentioned not too long ago the acorns are falling here in Minnesota and now the leaves are starting to change colors. So I guess we are in for an early Fall but I am perfectly fine with that. I love sweatshirt weather! Here is the card I designed for The Stamp Simply Ribbon Store. The beautiful sunflower image and the sentiment is from the Stamp Simply Clear Stamps - Sunflower Season SS-018. I did some masking with this card. It takes a little longer to mask the images but I think the results are worth the extra effort. 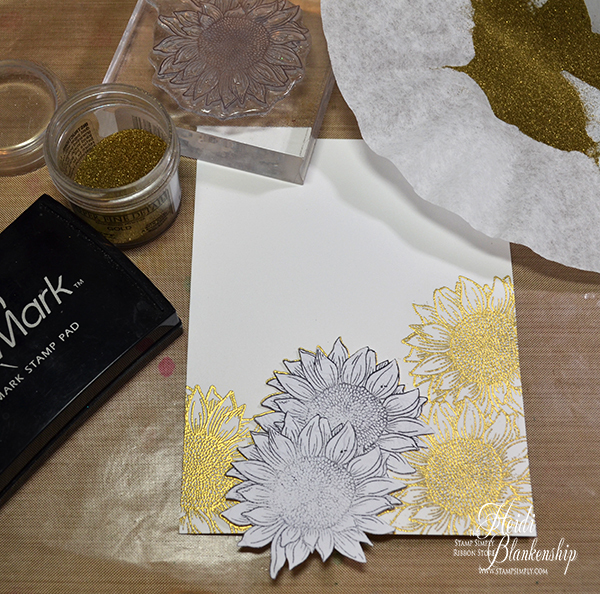 I stamped the image of the sunflower onto some Inkadinkado Stamping Masking Sheets and then I fussy cut them. Next, I stamped the image of the sunflower a few times with VersaMark ink and then heat embossed using Ranger Super Fine Detail Gold Embossing Powder. 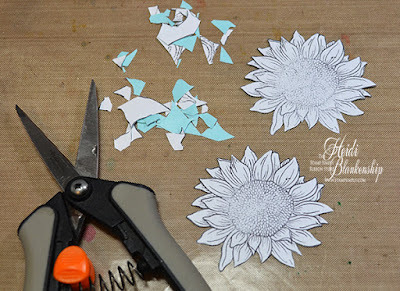 I would move the masks as needed to cover up the images and create the look of one larger image of sunflowers with the masking technique. For ink blending on the background I used Ranger Mini Blending Tools and Tim Holtz Distress Oxide Inks - Peacock Feathers and Twisted Citron. I was able to use the masks once again to cover the flowers and move them as needed. 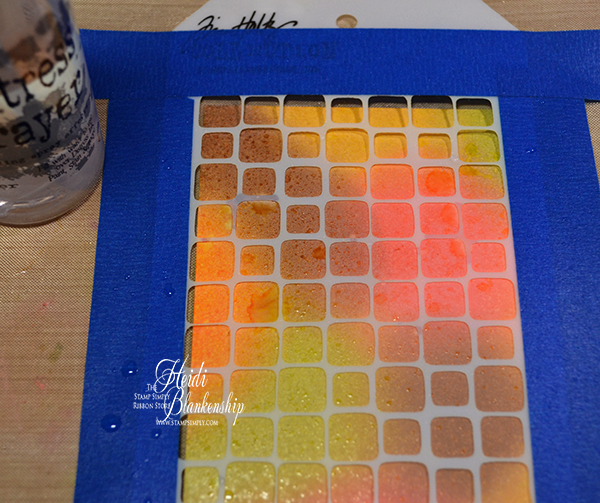 Once the ink blending was done I added water droplets using the Distress Sprayer. I let the water sit on the paper for a few seconds and then used a paper towel to blot up the water. The colors on the card are pretty bright and bold and I wanted to soften it up just a little bit. So I stamped the sentiment onto a piece of Vellum using VersaMark ink. 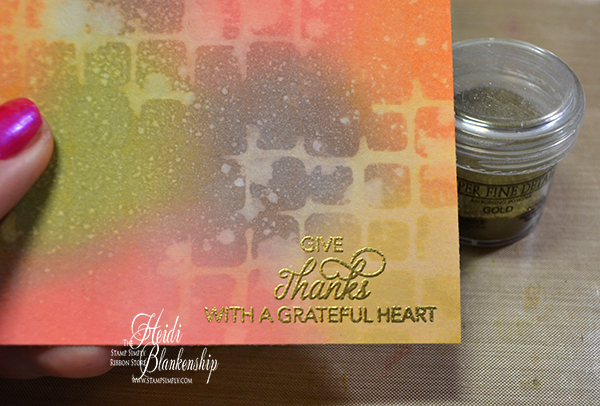 Then I used Ranger Super Fine Detail Gold Embossing Powder to heat emboss the sentiment. I wrapped the vellum around the back side of the card front and used some tape to hold it in place. 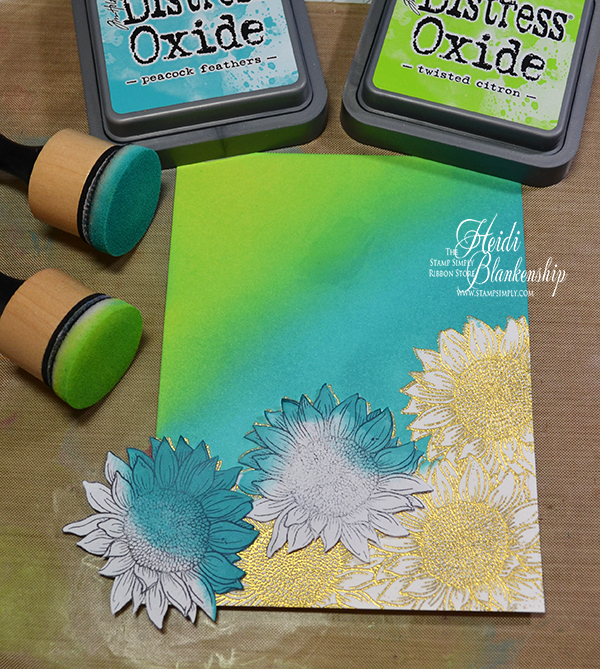 I used Tim Holtz Distress Oxide Inks Fossilized Amber, Spiced Marmalade, and Walnut Stain to watercolor the sunflowers. For the tiny bits of background towards the bottom of the card I just filled those in with the Peacock Feathers ink and a Water Brush. To finish off the card I added Scrapbook Adhesives by 3L Foam Tape to the back of the card front. Then I added that layer to a white A2 top folding card base. 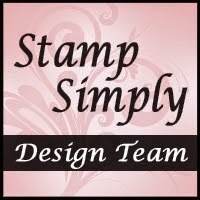 If you would like to see more card inspirations I encourage you to check out the Stamp Simply Blog. 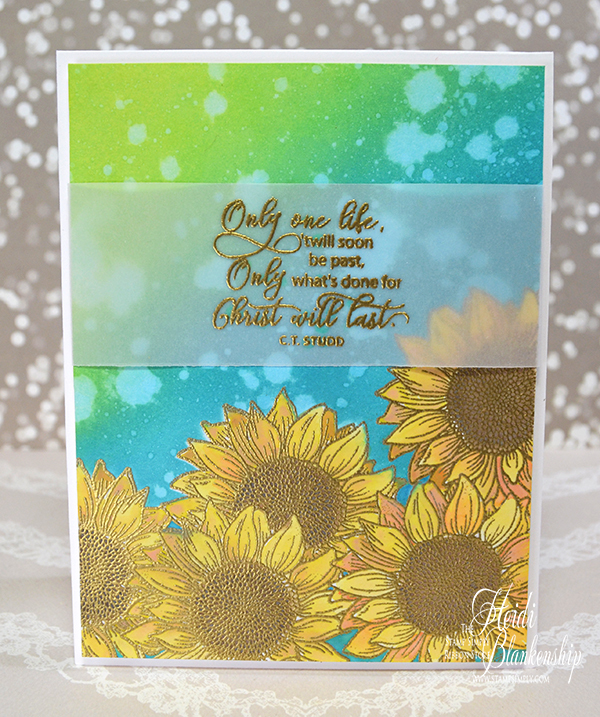 All of the supplies used to create my card can be found at The Stamp Simply Ribbon Store. Thanks so much for stopping by today and I hope you enjoy your holiday weekend!